It's hard for any public relations pro not to see the BP oil spill as a case study in crisis communications. Which is sad, because this is a disaster of monumental, historic proportions that will severely damage the environment and the ecosystem of a good portion of the United States for years to come, and will have a very negative impact on the livelihood of millions of people. An entire way of life may be wiped out. Everyone feels bad and everyone involved, from BP to federal, state and local officials is determined to work as hard as they can to limit the scope of this disaster. Unfortunately, if you live anywhere near the Gulf of Mexico, that determination is not enough to sooth your oil-soaked feathers. In a crisis, the first step is to show compassion. BP did that well. Company executives sounded sincere when they accepted responsibility and promised to do whatever it takes to stop the leak, clean up the mess and compensate the people and communities that have been affected. Step two is action. Again, BP did a good job of explaining the steps they would take to solve the problem, from robotic subs to plugging the leak by pumping it full of mud and cement. It was in step three that BP came up short. That's where you put things in perspective. As the CEO of a multinational company in an industry that rakes in billions in profits each year and is used to getting anything it wants rubber stamped by the government, it is easy to understand how Tony Heyward might be dismissive of people who question his decisions. And he is certainly under an enormous amount of pressure. Even so, when your company’s slogan is "Beyond Petroleum" and when you've just caused the biggest oil spill in history, it is not a good idea to explain that in the big scheme of things, this spill is relatively "tiny". Or as Heyward explained to the media, "The Gulf of Mexico is a very big ocean," Not good Tony, not good at all. So here we are over a month after the rig blew and BP is just now getting around to trying a few things that may or may not work. 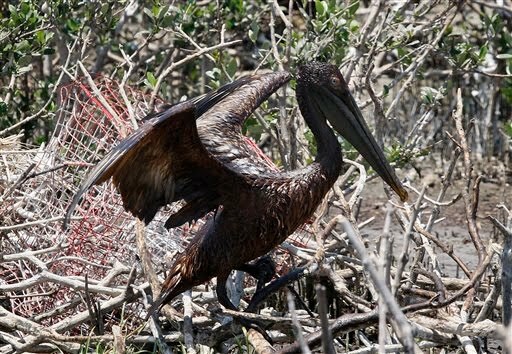 Each day as more photos of brown beaches and oil coated pelicans hit the Internet, people are demanding to know just what the hell is going on at BP. Even the anti-government crowd wants the government to step in. If I were advising BP right now, my advice would be to just shut up and plug the leak before it gets any worse. You've said enough already Tony. The Congressional hearing was bad. Please stop listening to your lawyers. Don't let your people dance around questions about what exactly you mean by a "legitimate expense." Just plug the leak, clean up the oil and then worry about how much this is going to cost you. Do it now or whether you like it or not, BP's new slogan will be Beyond Pathetic.